Boarding the train in Civitavecchia, Italy, on my way to explore Rome for the first time, I was prepared for the long day ahead. 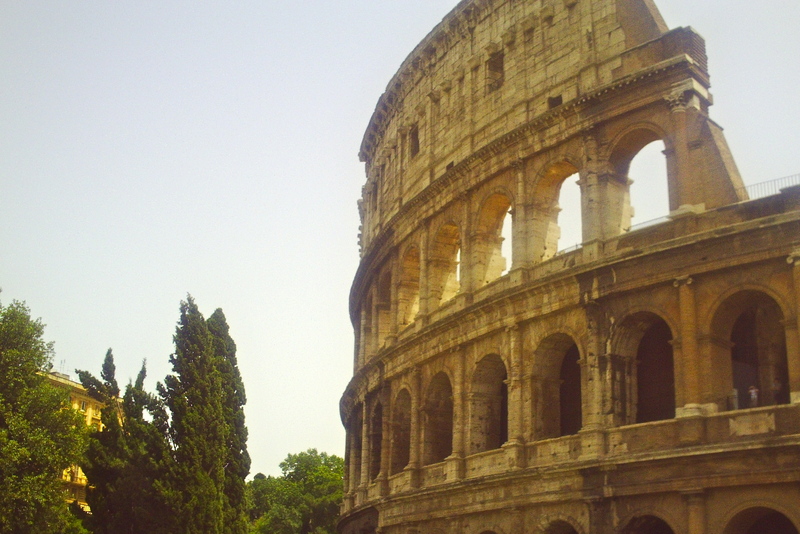 Having organized my own shore excursion to save money, in lieu of purchasing one through Royal Caribbean, I was aware of the strict timeline for my traveling companion and I. Twelve hours to make our way to Rome, explore and return. I had purchased train tickets in advance and the trip was approximately 1 1/2 hrs, each way. 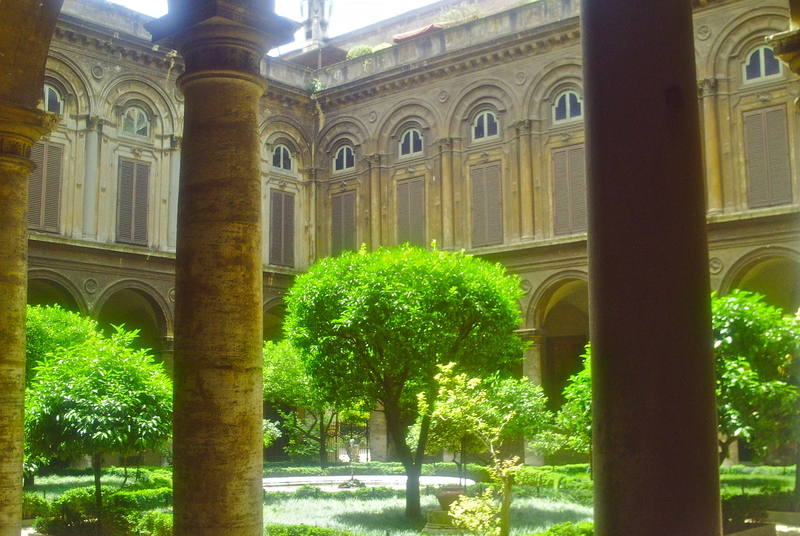 The first stop was Vatican City and I was surprised by how quickly we were able to gain entry. Unfortunately we weren’t able to see St. Peter’s Basilica because the Pope was going to speak. We quickly walked out of that Country and entered Rome! 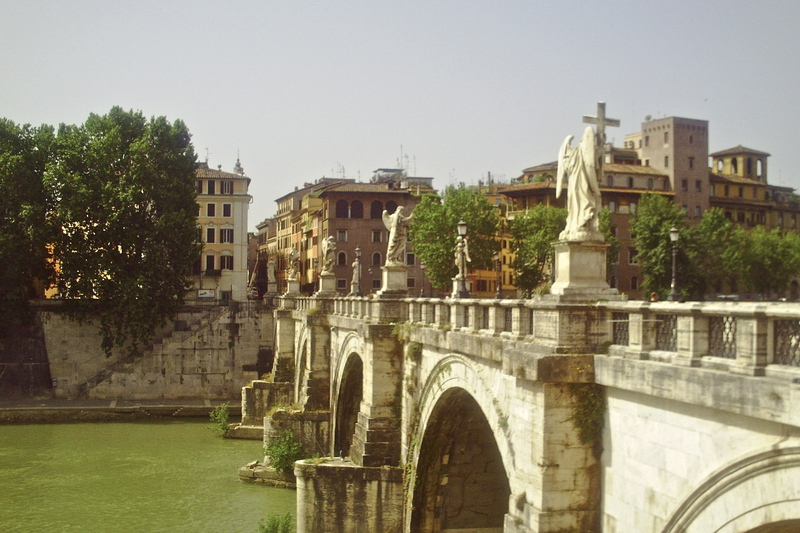 Next…we crossed the Tiber River. Side note: I was using someone else’s camera…mine had broken! This is where the fun started. Although we were equipped with three maps, locating the Pantheon was not happening. I’m usually very good with maps. I started asking people for directions. My theory from years of traveling is that unless you get a gut feeling someone’s directions are really good…ask someone else…which I did…again and again…so we arrived at the Pantheon (which I didn’t post a picture of). 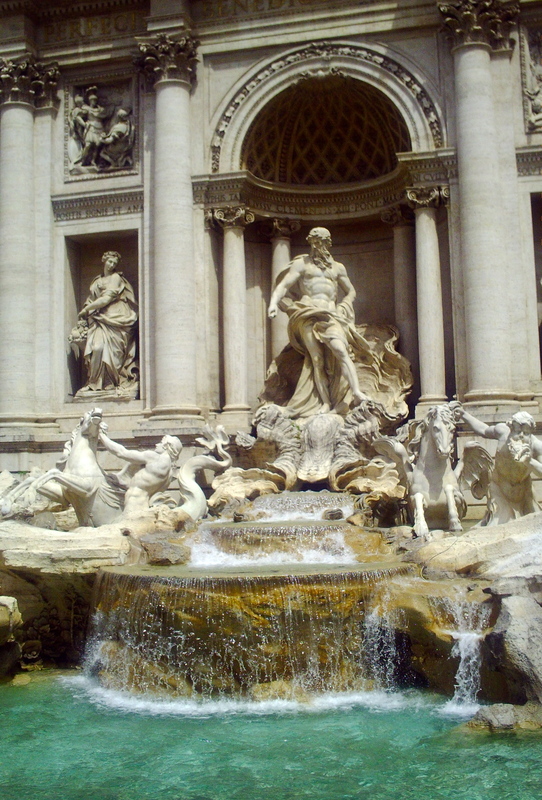 Multiple people were responsible for our arrival to the Trevi Fountain…which we tossed a coin into standing backwards. That way you are assured you’ll return to Rome! The following two pictures are obviously a street with lots of people and a street with very few! 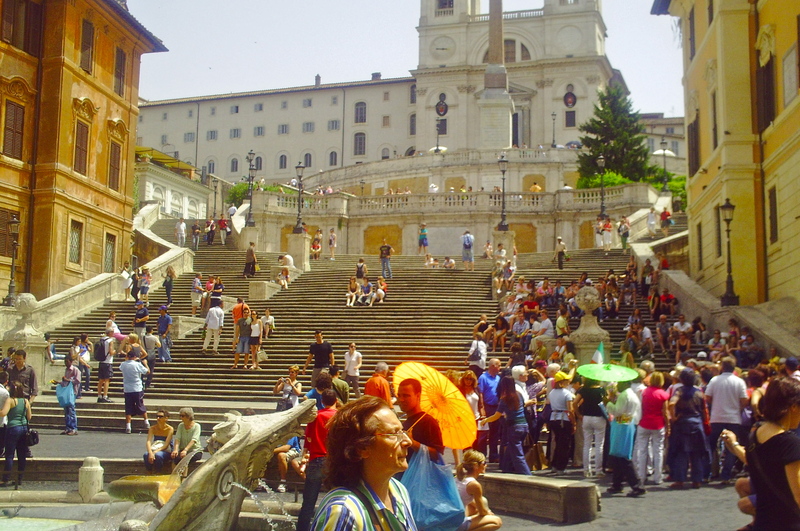 We were guided by a few kind souls to the Spanish Steps…which we didn’t climb attempting to conserve energy for all of the walking! I’m not sure what or where this was…but it had nice light! Finally, armed with directions from the friendly locals, we headed towards the Coliseum. 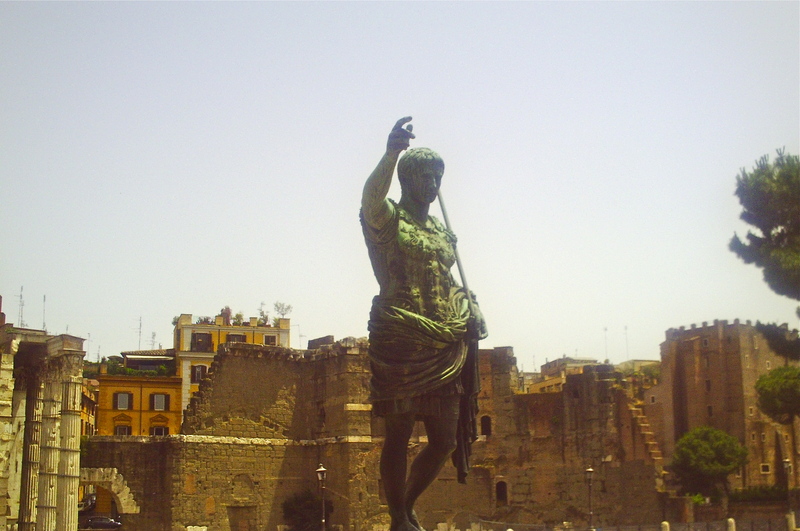 You can almost imagine yourself living back in the “hey day” of the Roman Empire! 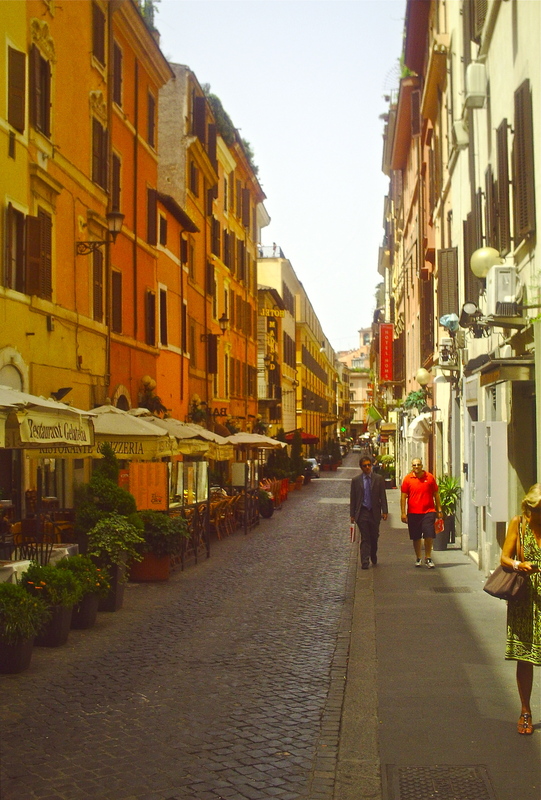 Rome was a City that surprised me for a variety of reasons. I was surprised that you’re just walking along and then the Coliseum is…just there…I thought it would be farther outside of the City! I did so much research on the flight, cruise, train travel and hotels that I didn’t research every City – I guess it’s nice to be surprised sometimes! 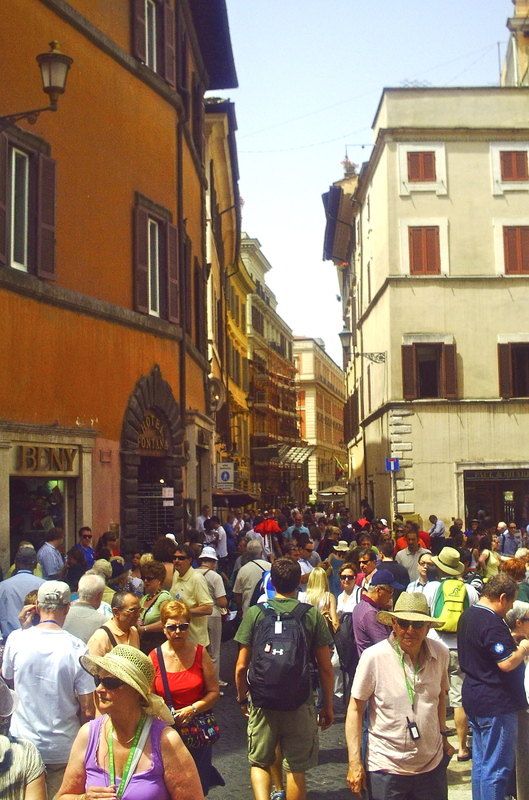 For some reason, I thought Rome would be a bit “dirty” and be more crowded, but it wasn’t! Tomorrow we skip over to Croatia…one of my favorite places! 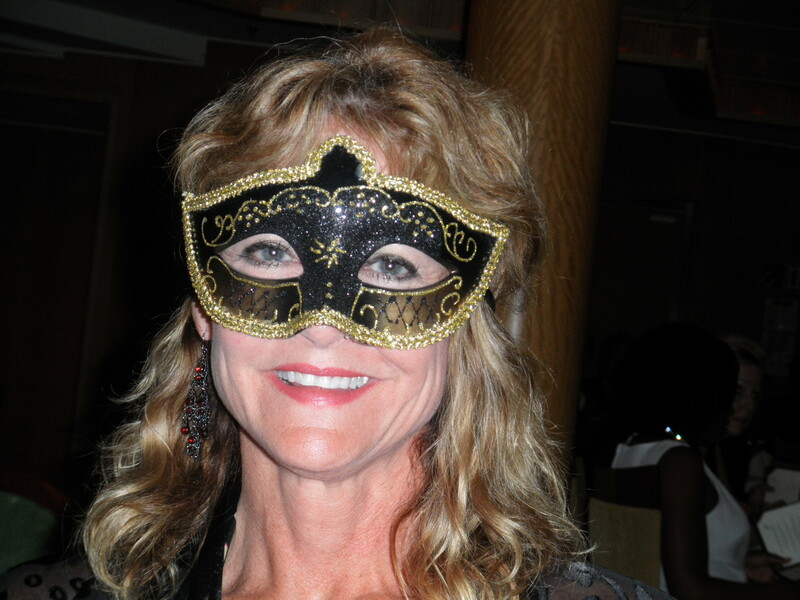 The evening that our cruise ship left Venice, there was a Masquerade Ball aka Bal Masque. 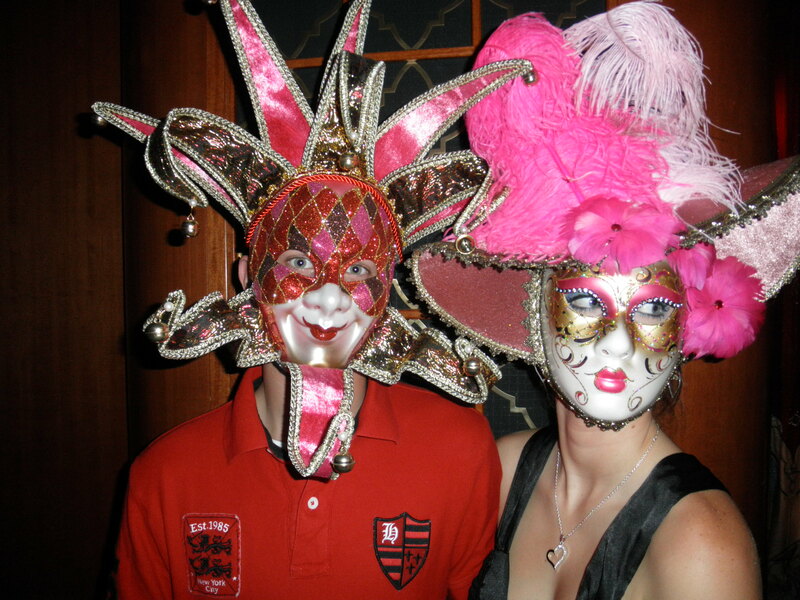 It was fun to see all of the colorful and unusual masks! Here are some lovely girls!! My mask was quite simple! I decided to pay Royal Caribbean the $150 to go on their organized shore excursion, since I had arranged all of my previous excursions. 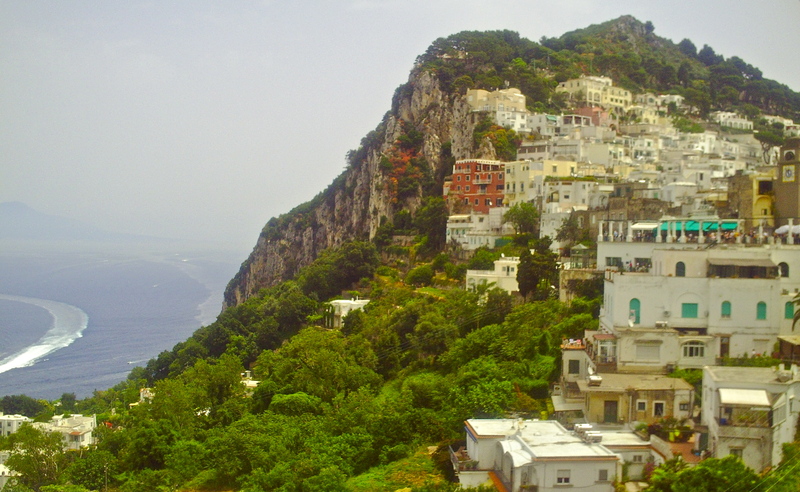 Once the cruise ship docked in Naples, Italy, I boarded a small boat and was stepping onto the small island of Capri within 45 minutes. 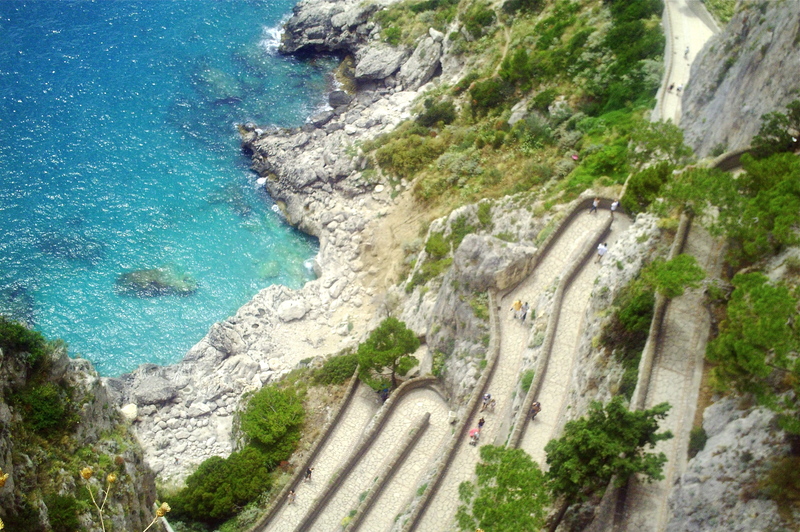 We boarded a bus for a unique ride to Anacapri, that took us up skinny, winding roads, past lovely guesthouses/villas and finally dropped us at a chair lift that takes you to the top of the island. During the chair lift ride, I was twisting and turning to take photos of the dramatic vistas! I love the excitement of being somewhere new and so very beautiful! The views were spectacular! You’ll notice these photos aren’t as clear and crisp as my others…there was a haze in the sky and I had borrowed someone’s camera, since mine mal-functioned. Our tour guide was Italian. I asked to take his photo and he insisted on one with both of us in the photo. Perhaps I am generalizing here…but it seems Italian men have an air of confidence and know when to take charge! Or maybe, they try to take charge all of the time. 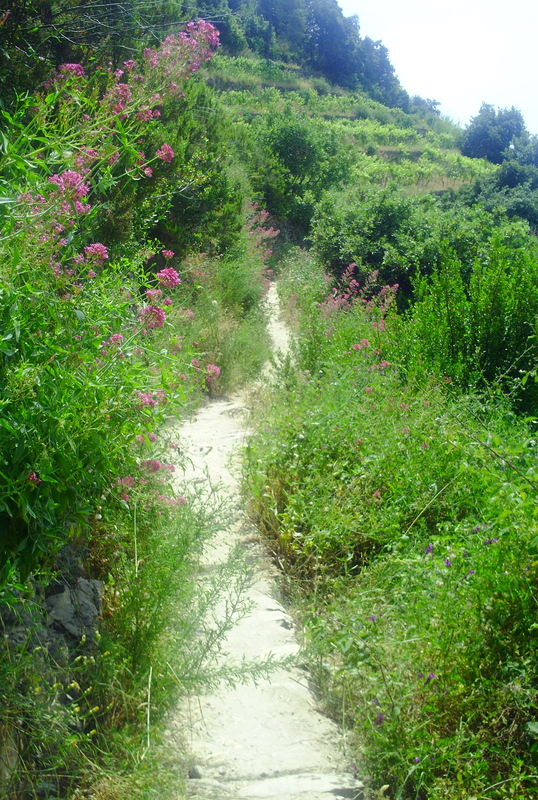 He led our group for a stroll through the exquisite and colorful “Gardens of Augustus“. It was very soothing and almost like a retreat! 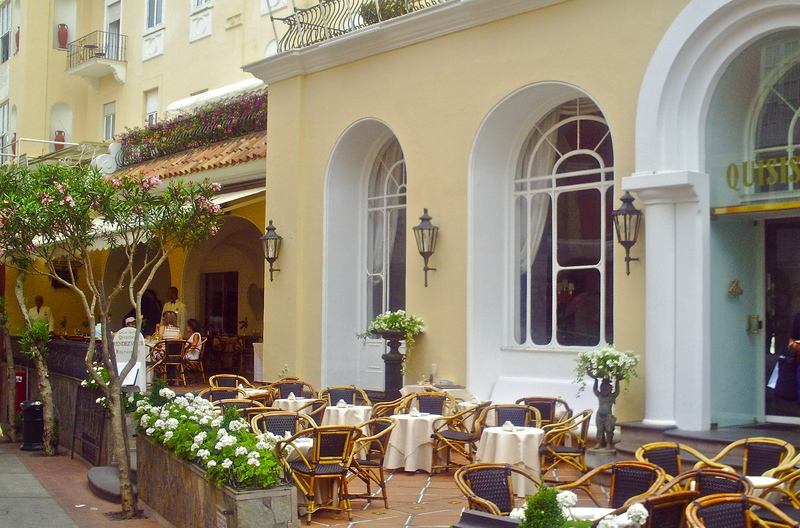 After our tour of the gardens, it was fun window shopping and I eventually found a seat at a quaint sidewalk cafe, and ordered a deliciously chilled Limoncello! Don’t tell anyone, but I also bought a bottle of wine to sneak on the ship and I wasn’t the only one. When on-board drinks are $8-9 each, it’s the smart thing to do. One of my doctors has been there and said the hiking is great. 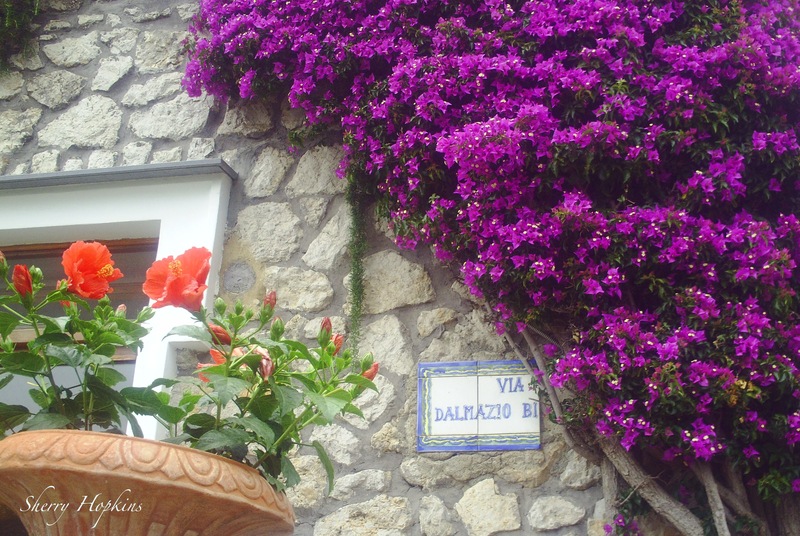 Although Capri is gorgeous, it was very crowded and touristy. If I were to return, I would prefer to explore other areas of the Island and hopefully escape some of the crowds! Tomorrow, we sail to Venice! 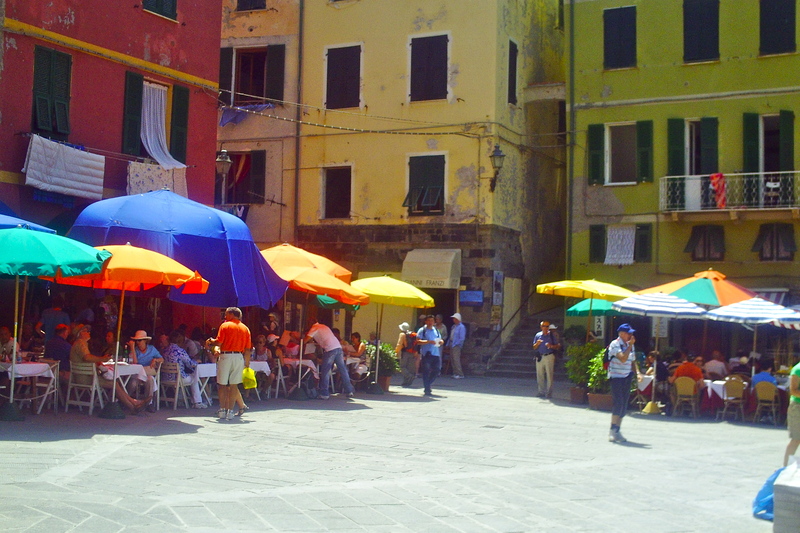 Although all of the destinations on my 12-night Mediterranean cruise (taken in 2010) were amazing, I was looking forward to Cinque Terre most of all, and it didn’t let me down! 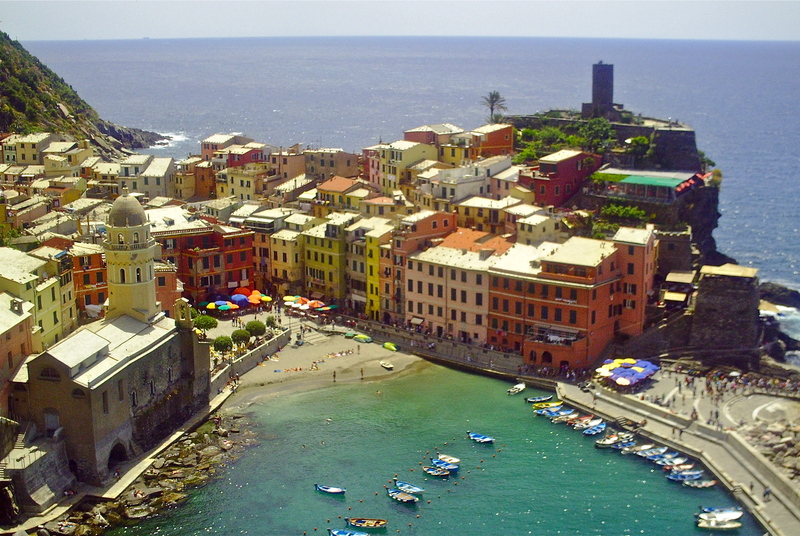 In 2006, I had spent hours upon hours researching and booked a solo, three week backpacking trip to Europe, to include Cinque Terre, and because of life, had to cancel it, so I was thrilled to finally have the opportunity to visit. Especially due to the recent disaster there! 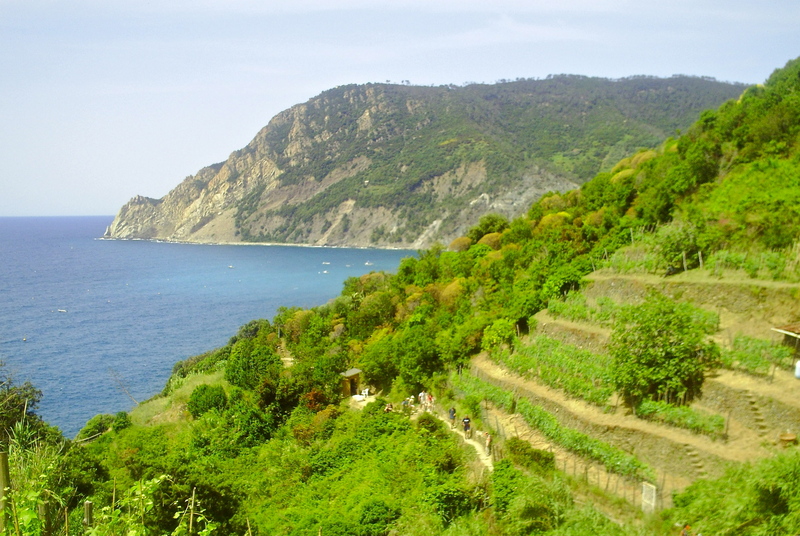 After docking in Livorno, we boarded our pre-paid/reserved train…a little over one hour trip…to La Spezia and then hopped on a short regional train ride that delivered us to the last of the five villages, Monterosso al Mare. I thoroughly researched this excursion, because when you’re on a cruise ship, timing is very important! If you miss your ship, you’re “ship” out of luck! 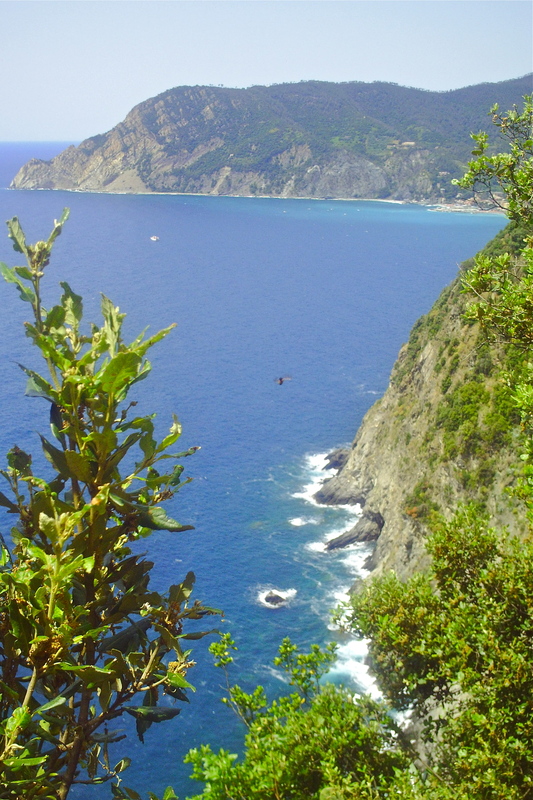 I took this photograph of Monterosso al Mare while hiking. Everyone that I spoke to on the ship was going to Florence and/or the leaning Tower of Pisa. They didn’t know what they were missing! 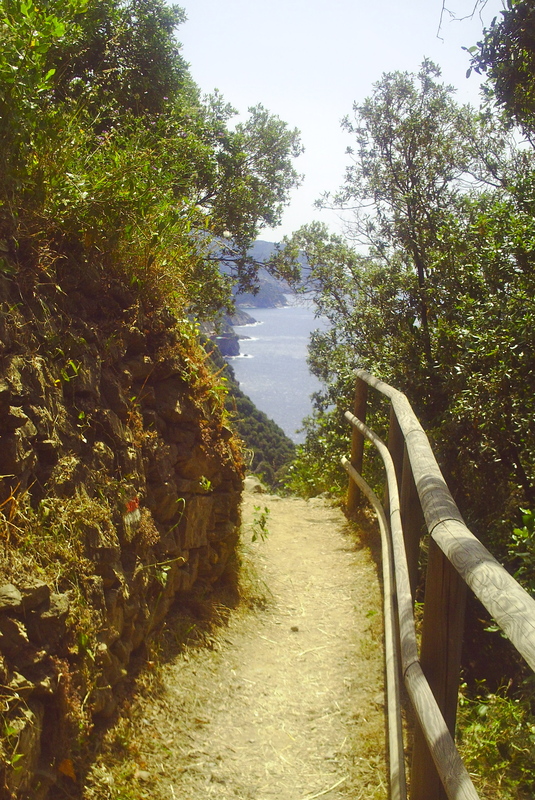 This is the beginning of the 1 1/2 hour trail that we hiked from the fifth village to the fourth village, Vernazza. Although I purchased some great Merrill sandals, especially for this trip, I was beginning to get a callous on the edge of my heel. But nothing could dampen the dazzling vistas! The entire region is a UNESCO World Heritage Site. The natural beauty was almost overwhelming! 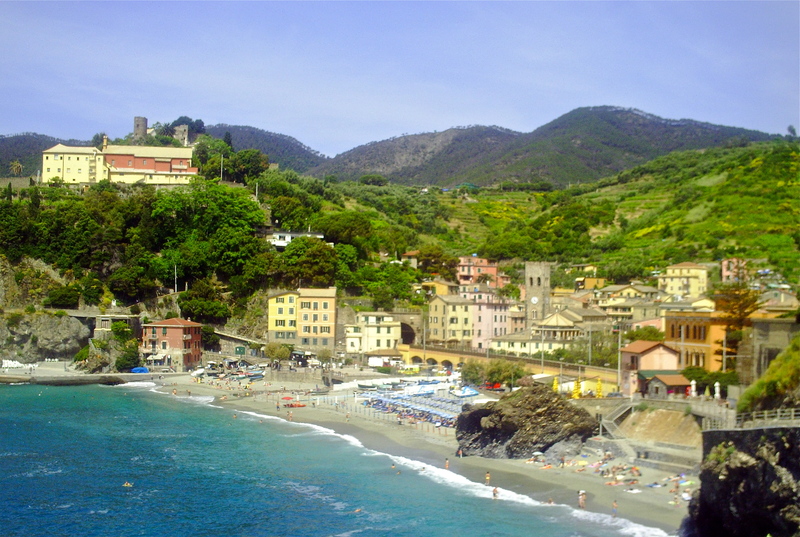 You can see the village of Vernazza in the distance. After having some lunch in town…due to time constraints, we took the train to the first village, Riomaggiore, where we briefly looked around and headed back to the train station in La Spezia. We had over an hour to kill at the train station, so we went for a walk and my traveling companion overheard a woman talking to a taxi driver about taking her to her ship, which happened to be Royal Caribbean. We spoke to her and within seconds we’re sharing the taxi with her to go back to the ship. Obviously, we weren’t thinking…we were over an hour away from the ship…and the woman said the taxi was only 10 euros…which is about $12 to split. Within a couple of minutes we realized that she was heading to a different Royal Caribbean ship and I’m asking “Guido” the taxi driver if he is going to charge us anything for taking us back to where we came from. He said he wouldn’t and started making a wierd gesture with his arms and saying in his half Italian and broken English that we were tight! Then…the lady wanted a receipt for her taxi ride and he wouldn’t give her one…gesturing and almost shouting…so she exited the taxi and on the 5-10 min. ride back to the train station, he is saying “Cacare”, over and over. Upon inquiring as to its meaning, he informed us it meant “F____ you”. He was upset with the lady wanting a receipt…so to break the tension…I requested him to teach us how to say it…so we’re all three in unison saying…”Cacare, Cacare”! If you’re ever in La Spezia and want an unforgettable taxi ride, try to find “Guido”! p.s. Later…I discovered from a fellow blogger that “Guido” is actually a slang term to denote someone that is lower or working class of American/Italian descent.